These cabinets for electrical and electronic equipment provide protection both for components from the surrounding environment and for users from electrical shock. They may be made from a number of materials, but often use stainless or carbon steel, aluminum and other metals or rigid plastics. Enclosures work to address any number of constraints, including heat dissipation, electrostatic discharge, radio frequency interference, and other practical and commercial concerns. Switches, knobs, displays, and other equipment can be mounted here for both utilitarian and aesthetic purposes. 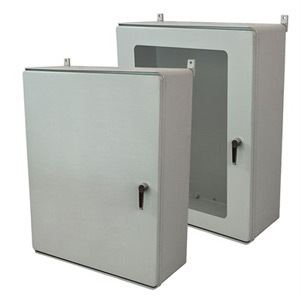 Regulations often determine the specific design and features for enclosures, especially in hazardous areas where national standards for certain protections must be adhered to, such as corrosion resistance and submersion protection. Mass-produced, standardized enclosures and custom-built models are available in the market.